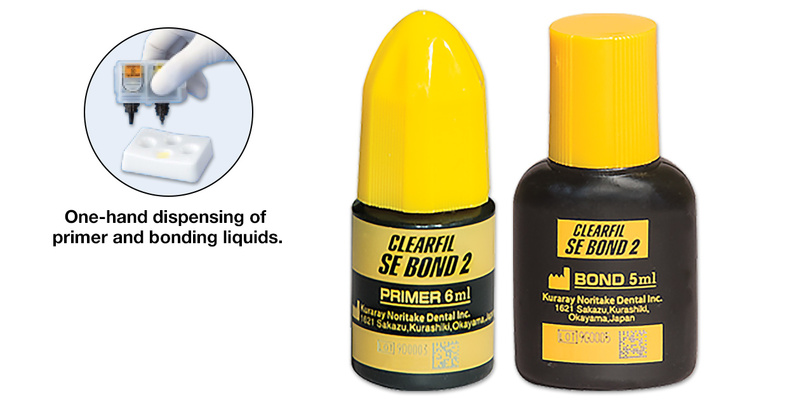 This updated formula of Kuraray's original SE Bond product can now be used as a dual-cure bonding agent when used in conjunction with Clearfil DC Activator. For use with all indirect restorations, core build-up and bulk fill composites. Same simple, proven procedure; no shaking or scrubbing required. Clearfil DC Activator sold separately and is not included in the kit. Contains: 3 x 6ml bottles SE Primer 2, 3 x 5ml bottles SE Bond 2. Most (81%) evaluators found its ability to bond to dual-cured/self-cured materials when mixed with the DC Activator to be a significant upgrade on its predecessor, allowing it to be used for virtually all procedures. Good bond strengths in self-cured mode even when DC Activator/Bond mixture is not light-cured as a separate step. Virtually no sensitivity was reported. Easy to use. Available in bottles and unidose. The dispenser received high marks from several evaluators. Still have to etch enamel with PA to get the best results. Several evaluators felt the Bond resin was overly thick. Dispenser doesn’t accommodate nor is there a kit that includes DC Activator. Can’t use the unidose in the dualcured/self-cured mode. With the strong legacy of its classic namesake, it’s still the gold standard for self-etchers and its expanded versatility makes it even better, but you still need to etch enamel for optimal results and, with the three components, it’s not just plug and play. Clearfil SE Bond 2 earned 4.6 stars out of a possible 5.0.